In my recent Big Sur race report, I wrote how that race was an “experience” and not just a race or run. The same can be said about the Bay to Breakers, though in a slightly twisted way. It is something to be experienced: the beauty of running through the City over to the coast, the challenge and notoriety of Hayes Street Hill, the smell of eucalyptus through Golden Gate Park, hoping to see the Bison in the Paduct as you run by, and the relief when the Pacific is in sight…all chased with the scenery of wild and crazy people in creative costumes (or nothing at all), various scents along the way (food, urine, marijuana, etc. ), blaring music from official and unofficial bands/DJs, and people from the neighborhoods (or those just hanging out along the course) cheering, yelling, high-fiving, twerking, etc. Yep, Bay to Breakers is a crazy, crazy event and experience. I will say that it seemed crazier this year – and I was in corral A. I can only imagine what it was like in the other corrals. All that considered, it was a blast and I will run it again…and again. Finishers. It’s not obviously stated, but, after a review the results pages, for the overall event, there appears to be 28,253 “official” finishers, for a male/female split of about 45/55. Of course, there are the hundreds, if not thousands, of bandits – which is typical of B2B. When I crossed the finish line, there was a couple of guys who were collecting their third medals of the day! Weather. The weather was perfect for a run: 63 with a light breeze. Once at the coast, it was pretty windy…but you’re done at that point. Course. 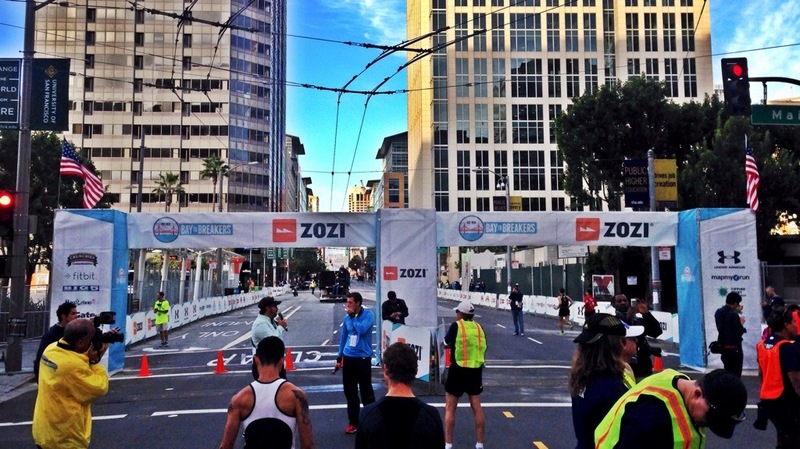 The course is a point-to-point from the Bay side of the City, through various districts, neighborhoods, and Golden Gate Park, to the seaside part of San Francisco. The course was slightly different at the end from the 2012 route. Management/Support. As I mentioned above, this year’s race seemed to be a little crazier than the last time I ran it – an observation that has been shared by many. Still, the management was pretty good. The biggest fail I noticed was when a group/crowd of several hundred slowly, en mass flowed onto the course at the Moscone Center. They effectively choked the route down to about 1/4 or less, forcing runners to move to the sidewalk or simply dodge and weave through the mass. I personally ran into a few people. It was a pretty bad scene and one that could have resulted in people be trampled or injured. Not sure if there was even any security or PD on that part of the course, though I’m not sure what they could have done. Aside from that, things were pretty good. Post-Race. The finish chute and post race area had a great flow, though I read on a blog or two that later in the race, things got pretty backed up with people. One thing that I felt was missing were more food vendors and a merchandise tent for B2B stuff. They had a stage for the awards and bands later in the day, but I was gone by the time that started. Medal/Shirt. Each finisher received a medal and event shirt. Both were pretty nice – pictured below. One thing I did notice was that the shirt did not have the event date on it. Hopefully, this doesn’t mean that the design will be recycled next year. This was my second Bay to Breakers. My first was in 2012, when I ran it with my brother. He’s a bit slower runner than me, so we agreed to stick together. This year, since it was just me, I planned to make good time; so I seeded myself in corral A when I registered. It was pretty nice being up front. In the end, I accomplished two of the three: I ran Hayes Street and I did have fun. I missed one hour by 2:57…oh well, next time. I kept this race pretty low key. I caught the race shuttle in Millbrae, got to the start line (finally, after our driver got lost twice), was user #1 on a portapotty (always awesome! ), and then just hung out in the corral until the start. Unfortunately, the start was delayed by about 30 minutes, due to a “unstable archway” at Hayes Street hill. People were antsy – I just hung out, threw a few tortillas, people watched, and chatted with those around me. I really felt bad for the elite runners as they had all warmed up for an 0800 start time and now had to effectively cool down. Most of the elites finished under 40 minutes, so they still made it home before breakfast! The race itself was a 12K blast. Being in corral A meant that I missed the more serious partying, but that was OK with me – I still saw my fair share of wild and crazy costumes and nudies: all part of the experience that is Bay to Breakers. I will say that this year, there seemed to be more crowds infringing on the course and interfering with runners – at least when the corral A group ran by Moscone Center. I read one article that seemed to advocate a “pause” of at least two to three years for the event so organizers could “reset” and gain some control. I don’t think that would solve anything. They have put more controls in place for the neighborhoods; but there are and will still be people who simply don’t care, ignore the controls put in place, and mess things up for everyone else. That is the way it is in life…B2B is no different. In the end, short of them cancelling the event, it will go on and I will continue to run it…always seeding myself in corral A, of course. Fueling. Since this was a short distance race, I didn’t really do any structured, pre-race, carb loading. Race-day fueling: Bagel with 2T peanut butter at -3 hours. During the race, I drank one serving of Tailwind Nutrition’s Mandarin Orange mix. Equipment/Kit [head to toe]: Buff cap, tech shirt from the 2012 San Jose Giants run, Armpocket armband, Garmin 910XT, Road ID (Slim), Amphipod handheld, ASCIS 55 Shorts, CEP Compression Sleeves, Road Runner Sports Dryroad socks, Altra The One shoes. Traditional throwing of the tortillas! With a sky like this, how could you not run! Giraffe and Ostritch Dudes…were in corral A too. Awesome view at the finish! Bottom line: Fun event. Ran Hayes Street Hill. I will finish in less than one hour next time!